Did you know that 34 percent of people attend or throw a Halloween party every year? Americans of all ages celebrate the mystery of Halloween and if you are planning to be one of those then I have some fun do-it-yourself Halloween tableware for you. 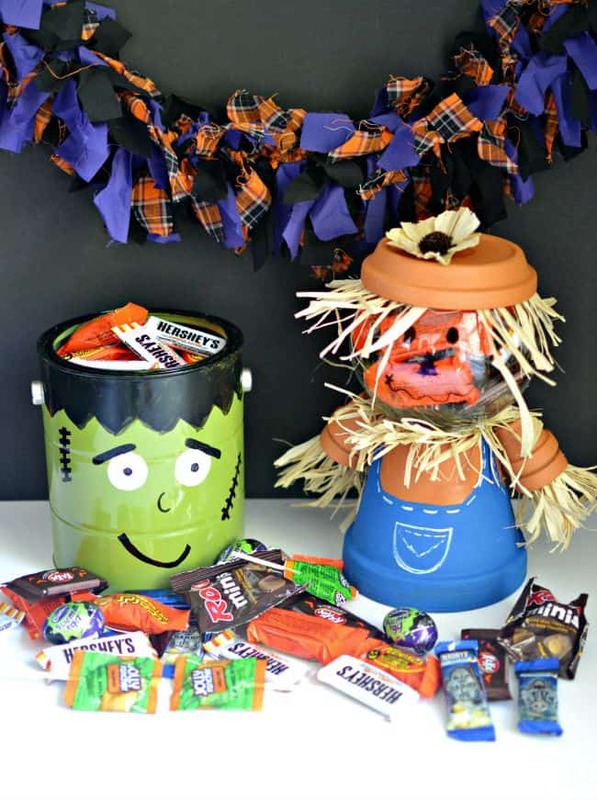 An incredibly easy Frankenstein and a little more advance but still really easy to create scarecrow candy dish. First I will start with the super easy to make Frankenstein candy dish. As I said this one is as simple as simple gets. 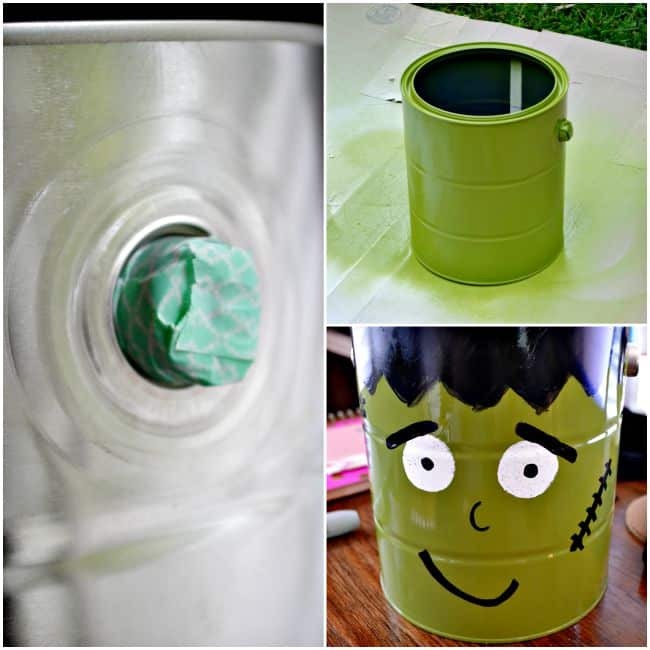 All you need to do is tape off the handle portion and then spray your paint can with Frankenstein green paint and then once you have allowed it to dry paint on his hair, face, scars, etc. You can either copy the face I created or create your own. However you choose to make him look will be awesome too. 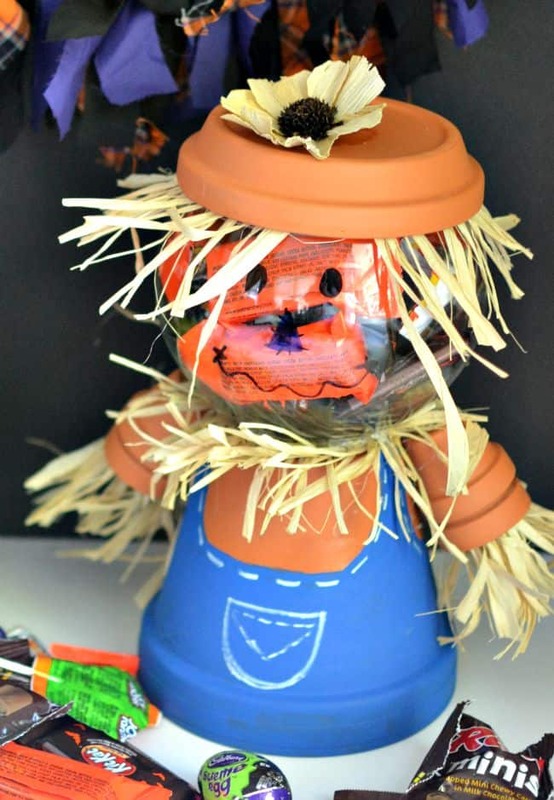 Next is the scarecrow candy dish. I am absolutely if love with the way this one turned out. He is so cute!! While the overalls were drying I attached 2 of the 1 inch terra cotta pots together to create an arm using hot glue. Do this again for the second arm. Once the overalls are dry you can now attach the arms to the body, once again using hot glue. Allow the arms to set and then attach some raffia into the insides of the arms. Next hot glue some raffia on the top of the terra cotta pot. Don’t worry about trimming it up, you can do that at the end. Once you have enough raffia to your liking glue on the glass bowl and paint on his face. The last part is gluing some raffia on to the underside of the saucer to create the hat. I added a little flower but that is optional. Embellish however you see fit. 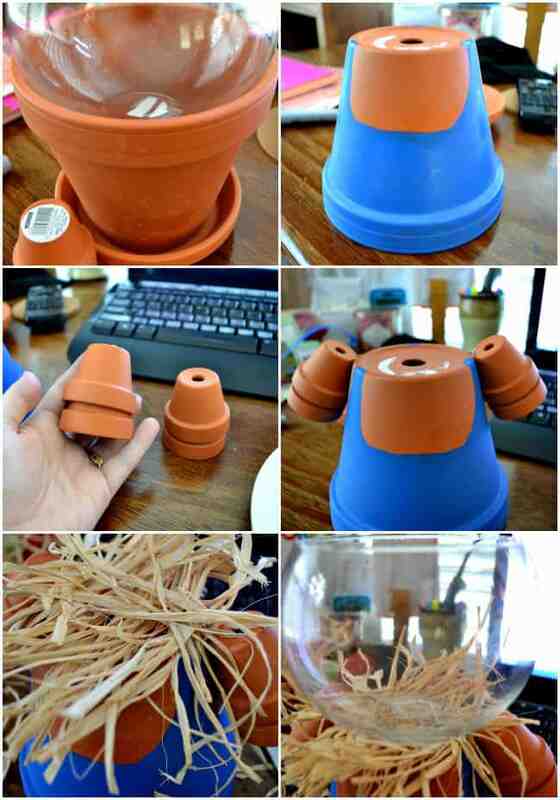 You could also attach a wooden knob to make the hat easier to pick up. Trim up the raffia to your liking and your done. 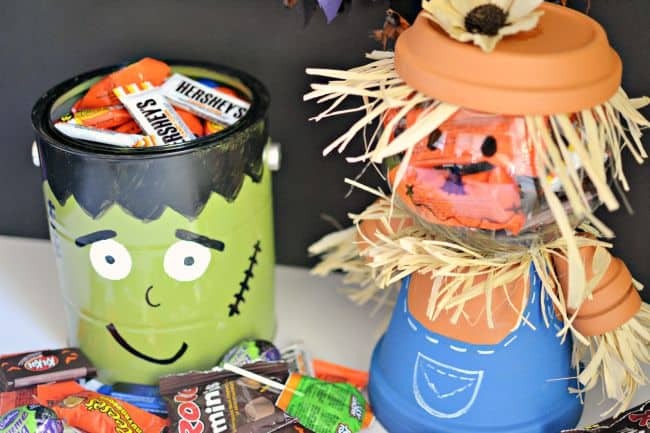 As you can see we added some of our all time favorite candy to these cute little diy Halloween candy bowls. Hershey is a seasonal favorite of ours especially Reese’s Peanut Butter Pumpkins, Kit Kat® bars and Cadbury Screme Eggs. Yum! 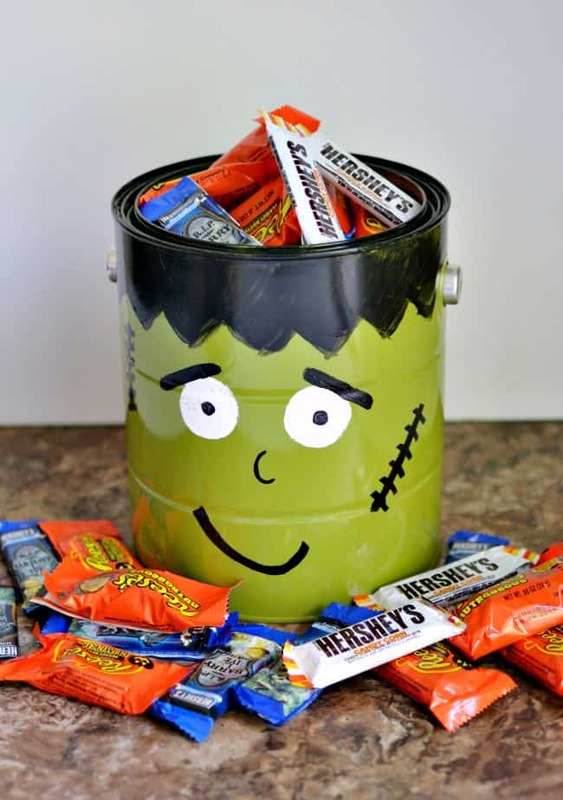 Hershey helps families harness that magic of Halloween with their classic treats and brings any Halloween party you plan to have from normal to paranormal. Do you plan to throw a Halloween party this year? Let me know if you create one of these fun diys. 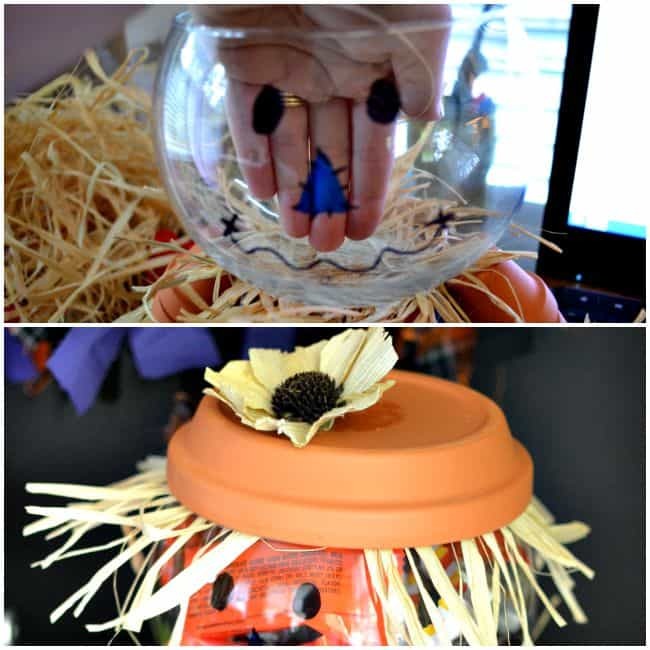 Click for more Halloween party ideas, for more costumes & crafts and for more Halloween recipes.